As the web matures, readers are beginning to expect a greater level of quality in the content that they find online. Search engines are adapting to this shift too: Google’s latest “Hummingbird” algorithm places priority on the “why” of a search and not the “what”. Gone are the un-glory days of “articles” (I use that term loosely) stuffed to the brim with keywords and SEO “optimization”. On the new web, successful content is personal, engaging and real. With that in mind, I’ve come up with three tips that you can use to improve your work and shake the bad habits of inauthentic, generic writing. When you’re writing, it’s very easy to inadvertently copy the tone and style of other writers. I am especially guilty of this – the subconscious mind has a powerful ability to shape and alter the way you use language and I find that many of us are natural mimics. When you’re writing your very first drafts, try to let your thoughts flow naturally. I find that dictation lets me be more spontaneous and creative than typing or writing with a pen or pencil. You can record using a smartphone’s “Notes” features, software like Dragon Naturally Speaking, a hand-held tape recorder or if you are using OS X “Mavericks”, the built-in dictation feature. When it’s time to check your first draft, look at the writing with a critical eye. Are you copying something you’ve read before? Does your writing sound like the copy from a print advertisement or the voiceover on a TV commercial? If it does, rewrite it as if you are speaking to a friend or family member. Readers are looking for intimacy and authenticity, not fluff and spin. It’s very difficult to judge the impressions our writing gives. Our perception of the quality and clarity of our writing will always be colored by our own expectations and beliefs about our abilities. As I mentioned in the introduction we want to write content that’s written from a real, honest place. One of the best ways to judge the genuineness of your content is the critique and commentary of others – it’s not important that the person know you in real life and you may find it valuable to source critiques from people who don’t know you. Be sure to ask them what impression they get from what you’ve written – does it sound like the work of a real person or a team of copyeditors? As far as I know, search engines are not yet at the level of being able to gauge the emotional content of a piece of writing, but people are very sensitive to these aspects of the written word. It’s always a good idea to choose subjects that bring you real, honest joy, excitement or even frustration. Choosing topics that really grab you will result writing that’s dynamic, passionate and exciting to read. Your readers will be looking for clues that help them assess your authority and knowledge but they will also be able to pick up on your emotional response to the topic that you’ve chosen. When we write with authenticity, we share our feelings both directly through the words that we choose and indirectly through our phrasing, sentence structure and grammatical quirks. Many of us default to writing in a formal style that deliberately conceals the author’s thoughts and feelings. I urge you to shake this habit, after all, if your readers wanted Wikipedia, that’s where they’d be. If you feel your content lacks in authenticity or isn’t as genuine as it could be, try revising it to share more of your feelings and thoughts about the topic. Don’t pack your writing full of idle musing; think of the emotional content as a rich spice and insert it sparingly. 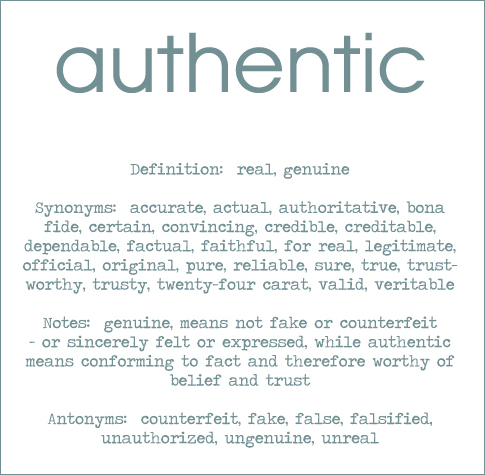 I hope these three tips help you to create more authentic, genuine and “real” content. You can use these concepts in new writing as well as old – revise your work often as your skills improve and you will see your audience grow and your body of work will better show your abilities as a content creator.